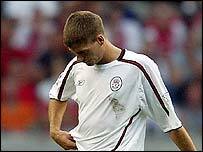 Liverpool had Steven Gerrard and Neil Mellor sent off as they slumped to defeat against Galatasaray in the Amsterdam Tournament. Goals from Brazilian forwards Joao Batista and Cesar Prates - with Vladimir Smicer replying for Liverpool - saw the Turkish side sink Gerard Houllier's men. Galatasaray opened the scoring in the 21st minute, when Hakan Sukur found Batista, whose crisp right-foot finish found the far corner of the net. Liverpool were almost level within minutes when Smicer dribbled past three defenders but shot wide. However, the Czech player made amends in the 36th minute when he crossed for Heskey to head home. But three minutes later, Galatasaray restored their advantage with a curling 25-yard free-kick from Prates. Liverpool striker Florent Sinama-Pongolle almost equalised on the break but Batista cleared the goal-bound ball to preserve the Turks' lead. The final minutes of the game proved costly for Liverpool with Mellor sent off for a tackle from behind and Gerrard getting his marching orders after picking up two yellow cards. To make matters worse, Smicer had to leave the field after picking up an injury. Liverpool manager Houllier said after the game that he did not anticipate Gerrard's sending-off resulting in the midfielder picking up a suspension.